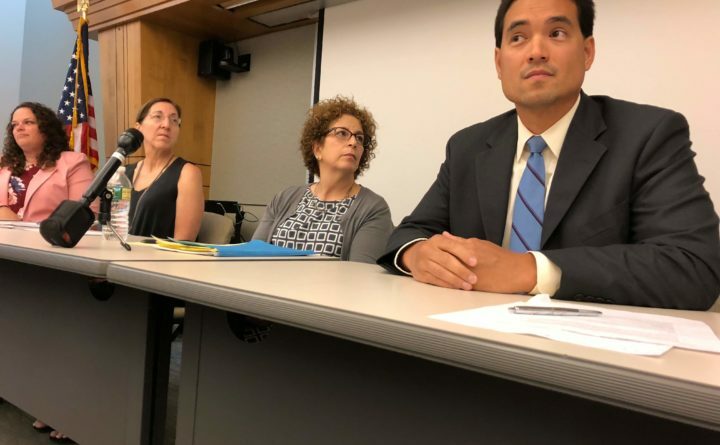 New Hampshire State Epidemiologist Dr. Benjamin Chan, right, sits as part of a panel of state health officials in Hampton, N.H., in August after the discovery of several cases of Legionnaire's disease. New Hampshire Department of Health and Human Services has issued an order to the Sands Resort in Hampton to immediately take steps to remediate the Legionella bacteria identified at its facility and to notify guests of the bacteria’s presence. NH DHHS sent the order to Tom Saab, owner of the Sands Resort at 32 Ashworth Ave., Hampton. The order was released to the media Sunday evening. NH DHHS has been investigating more than a dozen confirmed cases of Legionnaire’s disease, which resulted in at least one death. The illnesses have a reported onset dates of having been contracted between June 14 and Aug. 24. At least 12 people have been hospitalized, and one, an elderly person from out-of-state, has died. The Maine Center for Disease Control reported last week that there have been 16 cases of Legionnaire’s in Maine this year, with nine coming since the beginning of August. NH DHHS Commissioner Jeffrey A. Meyers issued the order after initial tests conducted by the Centers for Disease Control and Prevention detected the presence of the Legionella bacteria from multiple sources within the Sands Resort water system, including, but not limited to the hot tub spa. “Early test results from the CDC indicate the presence of the Legionella bacteria in several environmental samples taken from the facility’s water system. I have issued this order to ensure the health of guests and visitors of the establishment, as well as the health of Hampton residents and visitors,” Meyers said in a statement. “The Sands Resort will immediately notify current and future guests of the Legionella outbreak and take steps to remediate the premise plumbing system in order to mitigate the risk to the public’s health,” he continued. Legionnaire’s disease is a potentially serious bacterial pneumonia. State epidemiologist Benjamin Chan said the most common source is warm fresh water or wet soil. It is not passed person to person but is contracted by inhaling droplets of the contaminated water. It cannot be contracted by drinking or coming into physical contact with water containing the bacteria (such as while swimming). According to the order, the Sands Resort must immediately post signage notifying guests and visitors of the Legionella outbreak; notify all guests at the time of check-in and reservation of the outbreak; hire a Legionella consultant or environmental consulting firm to conduct an assessment within 48 hours and initiate remediation actions within 24 hours of hire; have an assessment performed by the consultant within 24 hours of hire and perform a written summary of actions taken toward remediation at least every 48 hours; perform ongoing Legionella testing to confirm remediation and report results to NH DHHS. For more information on the investigation, visit www.dhhs.nh.gov/dphs/cdcs/legionella.htm.